Bur oak (Quercus macrocarpa) leaf. Bur oak is a medium to very large tree with a broad, spreading, rounded crown, a massive trunk, and low, large, spreading branches. Leaves are alternate, simple, 6–12 inches long, 3–6 inches wide, spatula-shaped, and broadest near the middle; margin with 5–9 lobes, notches shallow on the outer half but deeply cleft near the base, the notch of the two largest lobes almost reaching the central vein; lobe tips rounded; upper surface dark green; lower surface downy and pale. Bark is thick, gray-brown, and deeply grooved at maturity; ridges long, flat-topped. Twigs are light brown, hairy, becoming darker and smooth with age; twigs often develop corky ridges after the first year. Fruits September–October, acorns solitary or paired. Nut brown, rounded to broadest near the base, ¾–2 inches long; cup deep, hairy, enclosing ½–¾ of the nut, the scales along the edge producing a fringed or ragged mossy-looking border. Acorns edible, ripening in autumn of the first year. Similar species: This is our only native oak to develop acorns with such an unusual fringed border along the cup. But there is non-native oak that also produces fringed or shaggy-cupped acorns; it is often planted as a street tree or in other landscape plantings and can escape into the wild: sawtooth oak (Q. acutissima), a native of Asia. Its leaves are quite different, being entire, unlobed, 4–8 inches long, with a toothed margin, with each tooth bearing a bristle at the tip (something like the leaves of an American chestnut). Its acorn cup scales are almost all fringed or shaggy, while only the scales along the rim of the cup are elongated in bur oak. Height: 85 feet (maximum about 120 feet); spread: 85 feet. The cup of bur oak acorns is deep, enclosing ½–¾ of the nut. The scales along the edge produce a fringed or ragged mossy-looking border. The names bur oak and mossycup oak both refer to the fringed scales on the edge of the acorn cup. 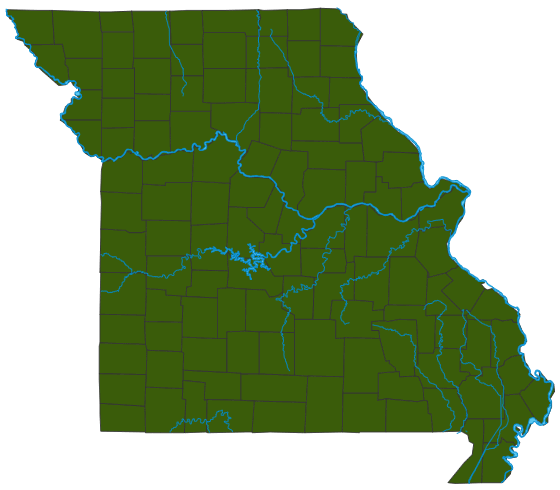 In the Ozarks, occurs in low woods in valleys or on lower slopes and along streams; in northern Missouri, occurs in upland woods as well as in valleys and in degraded or former savannas. It prefers the floodplains of our major streams but is also one of the few trees to grow on moist prairies and plains. When westward pioneers first encountered the vast sunny grasslands of the Midwest, the open groves of these massive trees provided them with the most delightful shade they had ever known. Sometimes called "mossycup oak" for the fringed scales on the edge of the acorn cup. "Bur" also refers to those shaggy fringes. Bur oaks can live for hundreds of years and become giants; many have legendary or historic status. For example, the famous Council Oak at Sioux City, Iowa, was the shade tree under which (according to legend) explorers Lewis and Clark met with a group of Native Americans in 1803; when it was cut in the 1970s, a replacement bur oak was planted soon after to mark the historic spot. In addition to being a shade and landscaping tree, bur oak is also used for its wood, which is similar to white oak and makes watertight barrels, flooring, furniture, and much more. Missouri's state champion bur oak in McBaine (Boone County) has a 91-inch-diameter trunk, is over 300 years old, and survived the flood of 1993. Specialists have been fertilizing and aerating its soil, carefully pruning it, and taking twig samples in order to preserve its extraordinary genetic line. Donald Culross Peattie once commented, "No child who ever played beneath a Bur Oak will forget it." As with most oaks, the nuts of this species are eaten by many birds and mammals. The larvae of acorn weevils eat acorns, too! If you collect acorns, don't be surprised if a few contain these grubs. Once the larvae exit the acorn, they burrow into the ground to become skinny-nosed, brown beetles.